21 Jun 2016 Frankfurt - On the Exhibition floor at ISC 2016 in Frankfurt, Germany, Primeur Magazine talked with Bo Ewald, President of D-Wave International. Bo Ewald helped the company focus on customers, applications and software tools. It grew up and grew all with high performance computing. Bo Ewald used to run computing at Los Alamos National Laboratory, was president at Cray Research, CEO at Silicon Graphics, and several other companies. He has been in high performance computing for a long time and he has been fortunate to work on quantum computing for the last three years. He thinks quantum computing is the most interesting and disruptive thing that he has seen in computing in a long time, maybe in his entire career. Basically, what D-Wave Systems has, are the first commercially available quantum computers. D-Wave machines have been around for four or five years now and they are really suited for optimization problems, probably machine learning, and thirdly Monte Carlo or sampling sort of problems. Without going into all of the quantum physics the way D-Wave machines work or a way to think about is that if you had a problem that you could map into three dimensions - mountains and valleys - what the D-Wave machine does about 10,000 times a second, is to find the lowest valley or valleys in that energy landscape probably. It is not guaranteed to find the lowest valley or valleys but it probably does. What it's really doing is searching through an N-dimensional energy landscape looking for the lowest energy solution. A way to think about it is energy landscapes - mountains, valleys - probably finding the lowest valley, Bo Ewald explained. Depending on what the problem looks like, if the problem is like a piece of sandpaper, flat with a lot of little mountains, you'll get quite a large distribution of answers. If the problem is like the Alps, where there are very steep and narrow mountains with valleys in between and some place, where there is one very low valley, most of the answers will end up being in that very low valley. The machine will use quantum techniques to find that low valley. It is probabilistic. People don't typically run a problem one time to get the answer but rather you run it a hundred times or a thousand times to get a distribution of answers. Depending again on what the problem is like, if it are these very steep mountains and one low valley, most of the answers will be in that low valley. Google who is D-Wave's second customer in fact, announced last December that they had learned about the D-Wave 1,000 qubit machine and created a benchmark problem that has very steep narrow mountains and a low valley. When they ran that problem on the D-Wave machine, it turned out to be 100 million times faster than on a traditional computer which is a huge number. The challenge now becomes finding problems that you can map onto this machine. Bo Ewald expects these machines to be used side by side with existing high performance computers or data analytics engines. That is what D-Wave's three customers are doing today. D-Wave's first customer was Lockheed who bought the first machine of 128 qubits about four or five years ago. They upgraded it to 500 qubits two or three years ago and they are now running on a 1,000 qubit machine. Their primary application started as software verification and validation. Now, they are looking at a broader set of optimization and machine learning problems. That machine is housed at the University of Southern California - Information Sciences Institute (USC-ISI). Lockheed users as well as USC-ISI and their affiliates are using the machine. Second customer was Google. The Google machine is located at NASA Ames in Mountain View, California, Silicon Valley. Google has about half the machine and NASA Ames about the other half. NASA and their researchers through their affiliate USRA are pursuing a broad set of research applications. Google is more focused on machine learning. D-Wave's third customer came to be Los Alamos National Laboratory, one of the Department of Energy labs in the US. They purchased a machine from D-Wave last fall and began running on it in D-Wave's factory at the time. That machine is just now being installed at Los Alamos. It will be in the unclassified environment. They have a whole range of potential applications that they are investigating: optimization problems, some machine learning, scheduling for high performance computers, and those sorts of things. The characteristics of those customers and the ones D-Wave sees in the future are that the D-Wave machines will not replace high performance computers. The D-Wave machines will sit side by side with high performance computers or data analytics engines and will help them get better answers. That is what D-Wave expects. The last thing for D-Wave to talk about is the big European initiative in quantum computing. It is terrific that a billion euros or more are going into the programme. Bo Ewald would think about that programme in a couple of ways. Number one: the programme will clearly help advance the state of things in quantum, whether they will be quantum communications, quantum devices or quantum computing. Beyond that, in the long term, the most important contributions from quantum computing will not be the hardware devices themselves but it will be the software that comes from it. Bo Ewald, together with people within the quantum community, hopes that a good share of that money will go into looking at algorithms and applications for quantum computing, not just the devices. In the long term, if you look at the computing industry, the biggest impact of today's traditional computing industry probably doesn't come from the hardware. It certainly started with the hardware as accelerators but over the long term, it has been software: Software to design safer automobiles, find more petroleum, alternative energy sources, problems of national defense. Those are all software problems. Bo Ewald thinks that, in addition to the great research on the hardware side of quantum computing, the big frontier is in software for quantum computers. This means algorithms, better software tools, and the environment for it. We are really right at the start of quantum computing and the era of quantum computing. 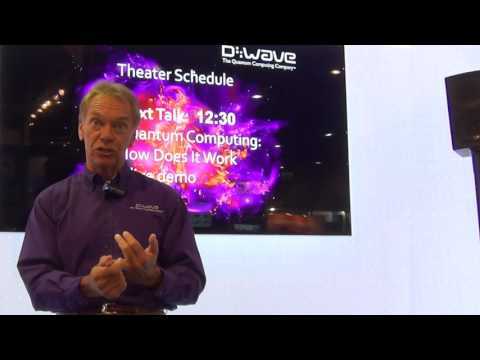 Bo Ewald thinks that D-Wave has the opportunity to have a larger impact on the future of computing than he did with Cray Research, Silicon Graphics or some of the other companies he had the opportunity to work with. It is really exciting, it is early days and D-Wave is looking for more smart people to help them figure out how best to do it.